Aura I & II, 2013, Hand-stitched white & black taqiyah (skullcaps), Perspex dome and LED light, 108 (Dia.) x 60 cm, also 71 (dia.) x 48 cm each. Aura II, 2013, Hand-stitched white taqiyah (skullcaps), Perspex dome and LED light, 108 (Dia.) x 60 cm. and 71 (dia.) x 48 cm. Aura I and II (2013 -) are hemispheric reliefs, constructed from white and black taqiyah (skullcaps), which are sewn together in a hexagonal pattern to create a large circle. 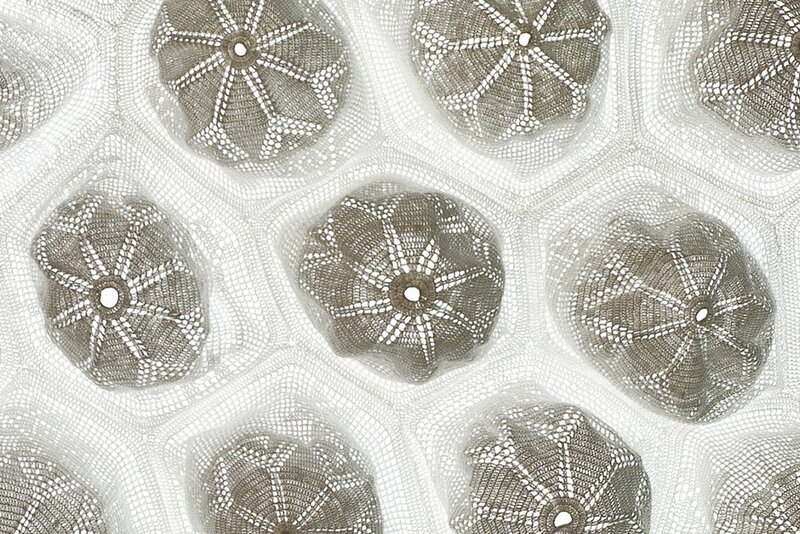 This circular ‘hive of caps’ is then mounted on white and black acrylic domes. The caps are puffed up, repeating the semi-spherical shape and producing a moon-like surface illuminated from within, creating halo-like effects. The halos are jamāli qualities of awe and beauty inviting viewers to stand in front of the sculpture, contemplate and be surrounded by it. The resulting works are glowing spherical moons, comprised of hundreds of prayer caps emanating light from within. Aura I and II are not only created to explore beauty, propositions and light, but also to explore the Divine essence that resides in sublime beauty. They reflect Syed's lifelong pursuit of this transient nature of beauty and perfection, which operates on both a perceptual and conceptual level, affecting the viewer with a very physical experience of a concept that is abstract in nature. At a distance, when a viewer stands still as a solemn whiteness in front of these glowing celestial objects, they are left in awe.